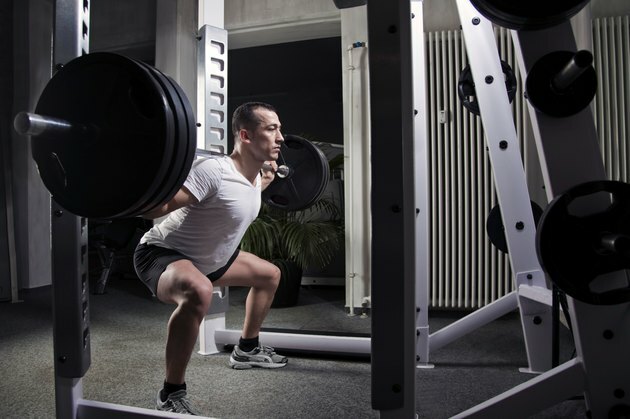 The barbell squat is known as the king of all exercises. It is a challenging exercise that works all your lower body muscles and makes you stronger; according to strength coach Jim Smith writing for Schwarzenegger.com, squats induce muscle growth all over your body. Squats are also credited for increasing testosterone levels. However, to get this hormonal boost, you need to perform the exercise at the appropriate intensity. Testosterone is the male hormone mainly responsible for maintaining muscular size and strength. It also plays a significant role in sexual and reproductive development and body-fat levels. Testosterone is produced in the testes in men, and in the ovaries and adrenal glands in women. Women generally have significantly lower levels. Squats work some of the largest muscles in your body, such as your hips, glutes, and quadriceps. Other muscles engaged include your hamstrings and calves. The erector spinae of your lower back, together with your abs and obliques, work hard as stabilizers when you perform squats. A study published in the April 2005 issue of, "Sports Medicine," notes resistance exercises that work a large muscle mass with sufficient intensity, may increase testosterone levels. Squats certainly fall within this category. "Sports Medicine" asserts that high-volume resistance training of moderate-to-high-intensity with short rest intervals stimulates greater hormonal response than high-intensity low-volume resistance training with long rest intervals. For example, after a warm-up with a light weight for 10 to 12 reps, do 10 sets of five reps each of barbell squats. Use 70 percent of your one-rep maximum, and a two-minute rest between sets. A study at the University of Kansas, Washington University, St. Louis, reported in the July 2010 issue of, "Fiziol Cheloveka," found that volunteers using a similar exercise protocol showed a significant increase in testosterone levels. Other multi-joint resistance exercises that work your major muscle groups may also help increase your testosterone levels provided you follow the high-volume, moderate-to-high-intensity protocol. Using 70 percent of your one-rep maximum, do five sets of five reps of the bench press and five sets of five reps of bar dips. These exercises target your chest and anterior deltoids. Hit the large muscles of your upper back with five sets of five reps of bent-over rows and pull-ups. Attach a weight to a dipping belt to increase your resistance for dips and pull-ups. As an alternative to squats, do five sets of five reps of deadlifts. Deadlifts work all the major muscles of your lower body, together with your erector spinae, trapezius and rhomboids. Your abs and obliques kick in as stabilizers. Can Squats Help Reduce Cellulite?